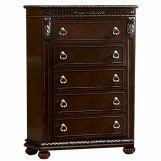 Drawing inspiration from the Victorian age, the design of the Homelegance Centinela Collection recalls an era of romance and formality. 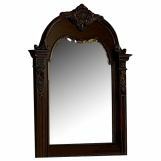 Shell carvings punctuate the crest of the bed and mirror while acanthus leaf motifs cascade along the framed pilasters. 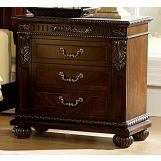 Egg and dart moldings flow effortlessly around each case piece and the quintessential Victorian design of beaded framing overlays the head and footboard. Adding to the generous design of the collection is the breakfront gallery dresser featuring a glass faux marble insert. 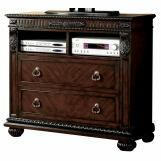 Constructed of hardwood solids and cherry veneers in deep cherry finish, Centinela brings Victorian charm to your home.